President Donald Trump on Friday continued to slam NFL players' national anthem protests, recommending players "Be happy, be cool" and "Find another way to protest." 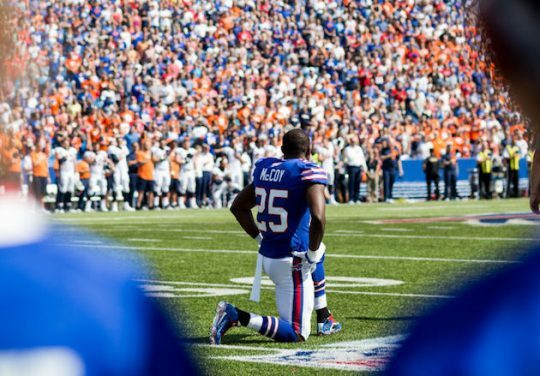 During Thursday's warmup games, several players took a knee, raised a fist, or did not take to the field while the national anthem was played, CNN reported. "The NFL players are at it again – taking a knee when they should be standing proudly for the National Anthem," the president tweeted. "Numerous players, from different teams, wanted to show their ‘outrage' at something that most of them are unable to define," he continued, although many NFL athletes have said the protests are meant to protest police brutality. Trump wrote that players should "Be happy, be cool," explaining that during the national anthem at a football game "is no place to protest." "Find another way to protest. Stand proudly for your National Anthem or be Suspended Without Pay!" he said. Trump and Vice President Mike Pence declared victory in May when the NFL enacted a rule that teams would be fined if their players were on the field and failed to stand during the national anthem. NFL Commissioner Roger Goodell said at the time, "This season, all league and team personnel shall stand and show respect for the flag and the anthem. Personnel who choose not to stand for the anthem may stay in the locker room until after the anthem has been performed." But the NFL has said it won't punish players who took part in Thursday's protests since the league shelved the policy until it reaches an agreement with the NFL Players Association. This entry was posted in Politics and tagged National Anthem, NFL, President Trump. Bookmark the permalink.